My big project the past few weeks has been trying to make s’mores from scratch. S’mores, an American campfire classic, is a sandwich of graham crackers filled with a square of chocolate and a fire-roasted marshmallow. My goal was to understand the mechanics of each of the components, to make each from scratch. All three parts have been added. The first question I had to answer is, What is a marshmallow? It is one of those questions that I had never considered. Turns out, marshmallows are a whipped mixture of gelatine and sugar syrup. I started by hydrating powdered gelatine in a mixture of water and coconut cream. A previous attempt used passion fruit juice, although the flavor became a bit sour as it cooked. In the future, I would add the juice near the end of the process. This time, I decided to try some coconut cream to see how it impacts the flavor. In the end, I couldn’t really detect the coconut flavor. Will have to play more with flavors in the future. 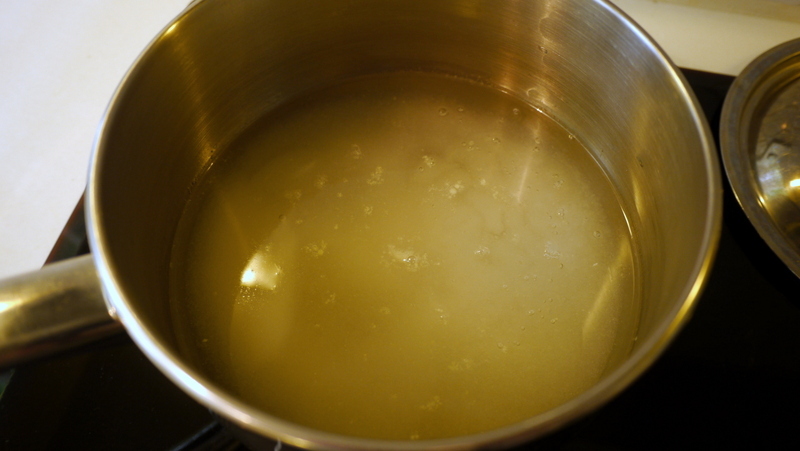 On the stove, I boiled a mixture of water, granulated sugar, and corn syrup. Once it boils, you keep heating it until it reaches the “soft ball” stage – 240 F / 115 C. You have to be super careful as sugar syrup can burn you something fierce. As soon as the syrup hits the target temperature, you drizzle it into the hydrated gelatine as the mixer stirs at slow speed. 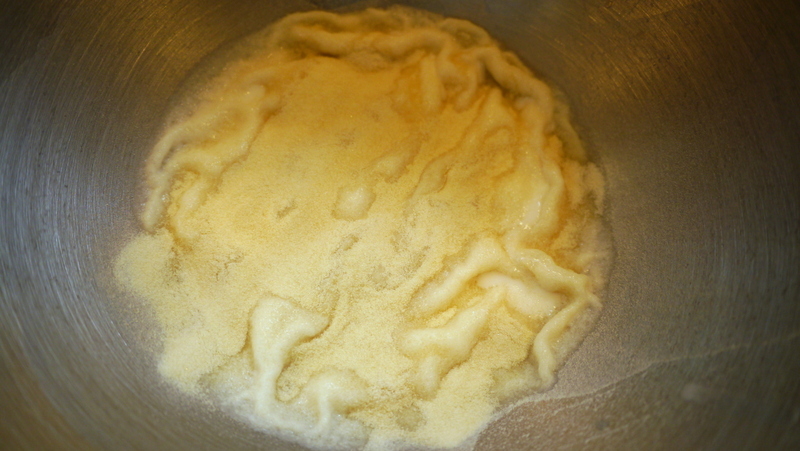 As soon as the syrup is incorporated, you increase the mixer’s speed to full and whip, whip, whip for about ten minutes. As you whip, the sugar mixture cools and, with the gelatine, starts to stiffen, trapping the air in millions of small bubbles. The more and the faster you whip, the lighter the marshmallow should be. The end result was like a jar of marshmallow creme. Most recipes call for spreading the marshmallow onto a baking sheet prepared with butter and a powdered sugar / corn starch mixture. I tried that the first time and you wind up with rectangular marshmallows. For this attempt, I used metal rings (also prepared with butter and the powdered sugar / corn starch) and used a pastry bag to pipe the marshmallow creme into the rings. Three words: big sticky mess. Afterwards, I dusted the tops with more of the powdered sugar / corn starch mixture so the marshmallows’ surface wouldn’t dry. Then I set the marshmallows aside to firm up at room temperature. It can take between six and twelve hours for the marshmallows to finish setting. To serve a roasted marshmallow without making a total mess, you need something to hold it. The perfect tool: a pair of graham crackers. Graham flour is a course whole wheat flour and graham crackers were originally created as a health product, which they are to some extent – if you ignore the butter and sugar! 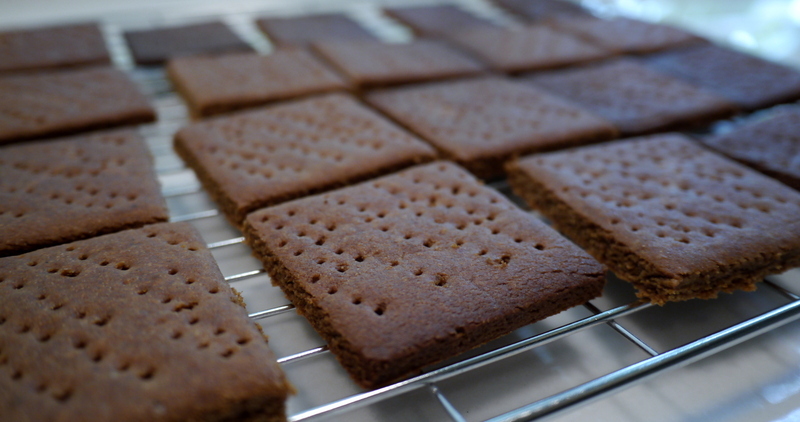 The results of an initial test batch of graham crackers, cut into a traditional square shape. I used molasses as the sweetener, which resulted in a darker dough. The second batch was made with honey, giving them a lighter color. Flavor is really good, especially since I put a good bit of cardamom in. Here’s the video… hope you enjoy! The following morning, it was time to remove the marshmallows from their rings, let them dry a bit more, and then take them to my friend Chow’s house where they would be dessert. The process of cutting them out of the rings was easier than I anticipated. A sharp knife, cleaned after each marshmallow, freed them from their metal cages. 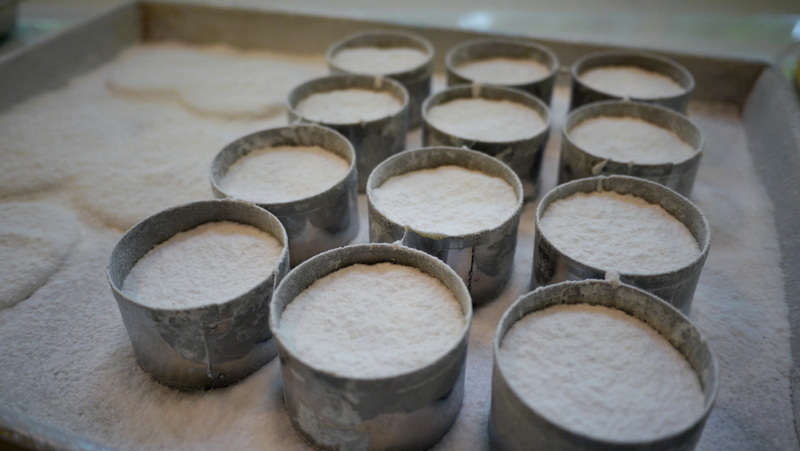 I dusted the freshly-exposed edges in the powdered sugar and corn starch mixture, to prevent them from drying out. 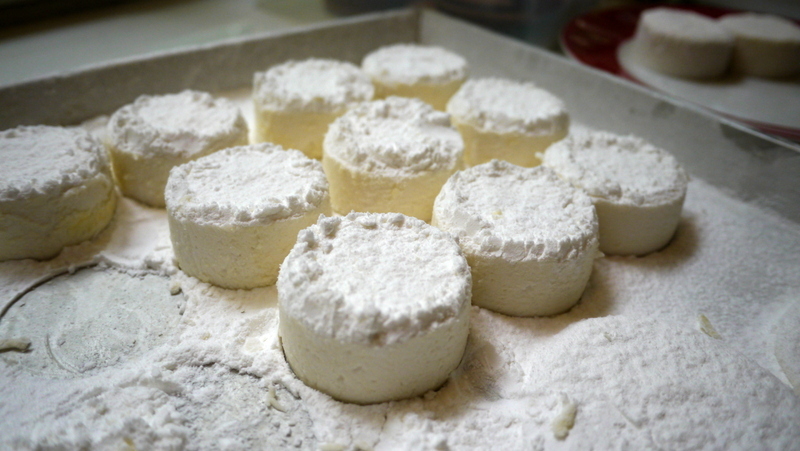 The finished marshmallows, just a little ragged around the edges, and the round graham crackers in the background. They had a really pleasing, spongy texture. Just wanted to keep squeezing them! That evening at Chow’s, the dishes were cleared, the graham crackers were put in an oven for a few minutes to warm them, and the chocolate ganache was put into a piping bag. Then the assembly process began! Since we had no campfire, I used a small butane torch to roast the marshmallows. The very high heat makes quick work of it, with the exteriors bubbling and caramelized long before the centers. The end result was every bit as sweet and messy to eat as you might imagine. 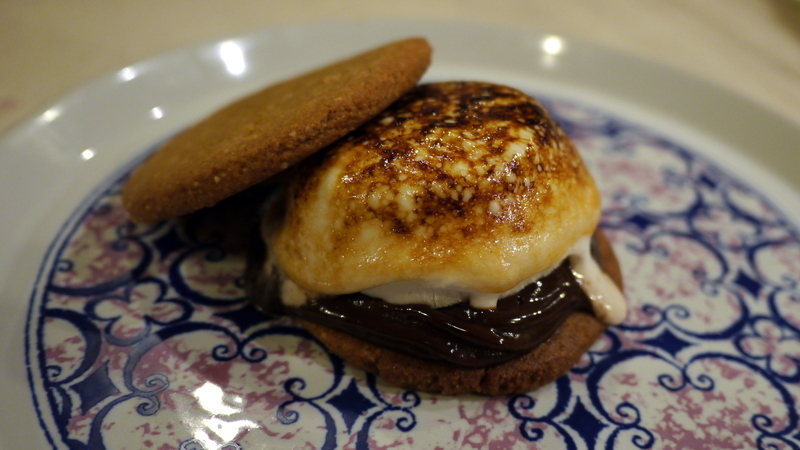 But for folks who grew up eating s’mores after a grilled dinner or while camping, they brought back memories. I’d classify this experiment as a success. I’ll definitely make marshmallows again – probably with my nieces – and homemade graham crackers are super easy to make, especially when you don’t cut them into circles. Thanks for your patience watching this series and for your feedback and comments. This entry was posted in Uncategorized and tagged Chocolate, Confectionary, Cookie, cooking, Cracker, dessert, food, Ganache, Graham, GrahamCracker, Marshmallow, Smores, Sweet by christao408. Bookmark the permalink. Very nice procedures, Chris. I’m looking forward to the finished product! Yum! How did you keep your kitchen so clean and neat? I have never had smores before. So this will be interesting to watch. Go Chris. I love smores but never would try from scratch! Waiting to see how those marsh mellows turned out. Enjoyed the video and instructions on how to make marsh mellows from scratch.Going to try this when my grandkids are here for the week ends. @n_e_i_l – Am making chocolate ganache. Trying to roast and grind cacao beans would be too much effort. 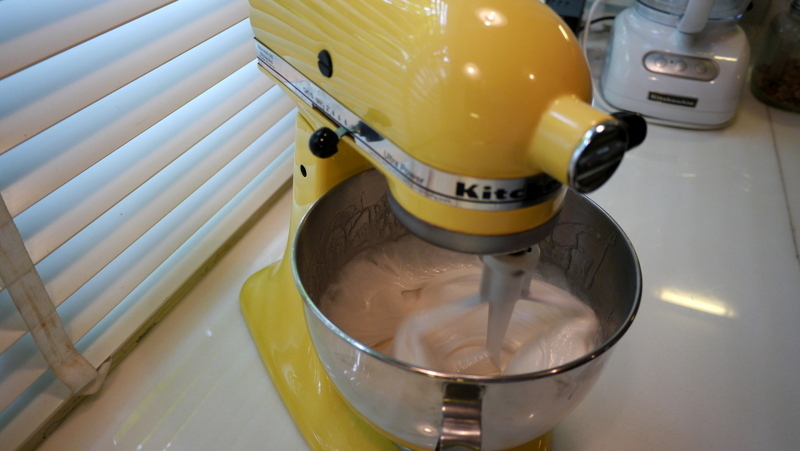 I’ve made marshmallows from scratch a number of times and used the wire whisk attachment on my KitchenAid which resulted in a tighter mixture than what your video shows. Chris this was so good to watch and learn. I am very happy that marshmallows can be home made. I used to love making s’mores for the kids from the store bought ones. Later I heard that the marshmallows in the store have pork gelatin. So that went out of the window. Now I am happy that you brought this to my attention. i could always give it a try. I didn’t even know that you could make them at home. Homemade marshmallows are even more delicious than bought ones are nasty, I admire your patience and talent!Piping tem into the circles looks like a great idea, I can not wait to see how they turn out. @CurryPuffy – Is my kitchen so neat and clean? I don’t feel that way… but just keep trying to clean as I go. @murisopsis – No, no… too much work. Chocolate ganache will be enough. @seedsower – Thanks for your comment. The second part has been posted and I’ll add the third part by Wednesday. @ZSA_MD – I always thought gelatin was made from beef? Guess I should find out what I’m using. Also, could use agar agar, which is made from seaweed, right? @p00kins – Excellent suggestion, thanks. I used the batter attachment because that’s what I saw someone else use, but of course a wire whisk should incorporate more air. @Grannys_Place – Other than the possible risk of someone getting burned by sugar syrup, I think this is a fun recipe for children. It also teaches them patience, since the finished product takes hours to dry. @Fatcat723 – Well, someone has to try it, right? @ElusiveWords – Matt, you are not alone. Tawn had never tried them before and, upon trying them, stated that he didn’t understand what the attraction to s’mores was. I agree with Tawn. I don’t get it either. Wow That is interesting. I think that is a project for a person with no kids around LOL i think ill stick to market bought ingredients but I wish I could taste that! I bet it was heavenly! So interesting, I am loving it. Trying to figure out where you grew up, you do not sound a lot different than the East coast but a few words sounded a little different. I am in SE PA.
Oh that looks so good Chris. Even the darker ones with the molasses would look good I am sure. You are a Rembrandt in the kitchen Chris. I loved watching that video. You are incredible. Watching people do things like that is nice. @christao408 – perhaps you should take Tawn camping. I think he’ll enjoy roughing it in a tent, sleeping bag, campfire… it would make a very interesting video. I’m not even a fan of the S’more but I’m salivating watching this! I can’t wait to see the final product! @LostSock21 – Will have to remember that if you’re ever over for dessert! LOL@murisopsis – Actually, just added it… let the salivation continue! @ElusiveWords – We have gone camping, actually. Back in the US, we camped on the coast near Half Moon Bay (south of SF) with my Girl Scout Troop Leader aunt. @Devilzgaysianboi – I think the graham crackers had a familiar texture to the store-bought ones, except that this batch used ground almonds in addition to whole wheat flour, so they weren’t as dry. The initial batch I made with just flour had a very similar texture to store-bought. @nov_way – Glad you enjoyed it. @ZSA_MD – Thanks for the recommendation, Dr. Z. You are much too nice. @seedsower – Thanks for the recommendation, too. As for my accent, I spent most of my life in California but with Midwestern parents, so I tend to wander a bit and don’t have a distinctive west coast accent. 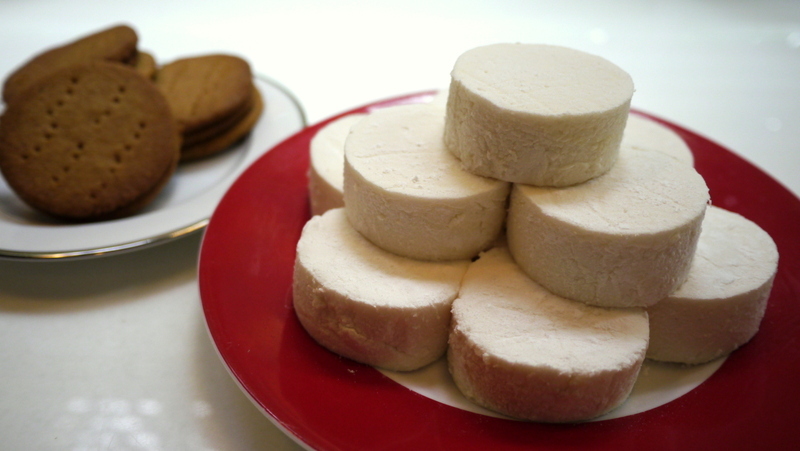 @Ikwa – Of all the parts, I’d encourage people to make homemade graham crackers. Easy and fun, plus you can customize the flavors. Marshmallows are a bit more work but a magical project for children. @Grannys_Place – Forgot to thank you for the recommendation. Thanks! Amazing! This was so fun to watch from beginning to end! Fascinating to follow the production process. Since I am no camper, I cannot relate to the “feeling” resulting from eating S’Mores. This was absolutely fascinating to watch. You make it look so easy. I probably would have put the marshmallows, graham crackers and chocolate in the mixer, roll out this big sticky ball and get the torch to it. Btw – in the first and second video, the sound on the right side seemed very low. But your voiceovers in the 2nd video are loud and clear on both left and right channels. Oh my gosh. Complexity in the most unexpected places. Yummy, Chris. A friend of the Tebows makes marshmallows with her elderly mother that melt in the mouth. As you demonstrated, they are time consuming for drying, but not really difficult. I like the idea of varying the flavors of the graham crackers. Where did you get your recipe? I might give those a try myself. They are a good lower-calorie snack. Thanks for sharing. Before reading the texts, I thought you were making biscuits.Speaking of biscuits, I am looking for a delicious buttery and fluffy recipe. Any leads? @ElusiveWords – Good catch on the audio. The camera uses a smaller than normal sized audio jack and so the lavalier mic needs an adapter. I’ve noticed that the connection is loose and sometimes only one channel records. The sad thing is, I didn’t notice this problem to begin with and actually I made graham crackers and mashmallows the first time, filming the whole thing with no audio. D’oh! So what you view here is a repeat performance. Sad, sad, sad… but at least I’ve learned to monitor my audio levels closely. @npr32486 – Bwahahaha… my plan worked. @beowulf222 – Gooshy, chocolaty, sticky, sweet beyond all belief, and a little crispy. That’s the feeling. =D@seedsower – So glad you enjoyed the series. @Devilzgaysianboi – Wish I had one to give you, Kevin. if only i live in bangkok. i’s go for camping at your place every weekend ’till you and tawn get sick of me :p by the way, i read recently of a bakery in USA makes smores using smoked chocolate to get that “bonfire” taste. neat, isn’t it? @Wangium – I’d suggest my recipe: 2 cups all-purpose flour, 1 T sugar, 1 T baking powder, 1 t baking soda. Mix together. Add 1/2 c Crisco and cut into the flour until you have pea-size pieces. Add 3/4 c buttermilk and stir together to moisten all ingredients but will not yet combine into a solid mass. Turn out onto a lightly floured board and knead five times. Pat the dough to 3/4-inch thick and cut with biscuit cutter into rounds. Bake in a preheated 425 F oven for 10-12 minutes or until golden brown.Three key tips to ensure biscuit success: Do not overwork the dough – minimal gluten development is best. When you cut the dough, do not twist the biscuit cutter (or glass, if you are using that) – twisting seals the edges and minimizes the dough’s ability to rise during baking. Finally, make sure your oven is nice and hot before you start mixing the dough – don’t want too much resting time for the biscuits and you don’t want too cool an oven.Hope this works for you! @jandsschultz – I used Alton’s Brown’s graham cracker recipe as a starting point: http://www.foodnetwork.com/recipes/alton-brown/graham-crackers-recipe/index.html. From that recipe, I changed the spices, switched to honey as a sweetener, and used cream instead of milk. @VNlilMAN – Glad you enjoyed. @iskrak – Very nice of you to say. If we had children, we would be the luckiest parents ever.